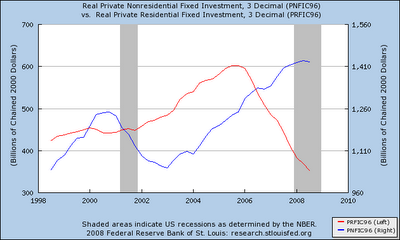 This graph shows residential investment (in red) and nonresidential investment (in blue). Notice how strikingly different the two recessions are. The last recession shows up strongly in nonresidential investment, while residential investment hardly notices the downturn. This time, residential investment takes a big plunge, while nonresidential investment has not been much affected (yet). More evidence that business cycles are not all alike.